To cope with the illusion created by drift by maintaining coordinated flight in turns. How to maintain a desired track by compensating for the effects of drift while manoeuvring at low level. To increase the ability to fly coordinated in challenging conditions. To experience illusions in flight. How do we correct for drift? For a given airspeed, how is the turn radius affected by the angle of bank? what happens to the aircraft’s ground speed in downwind leg ? The aircraft’s movement is directly related to the speed and direction of the air. 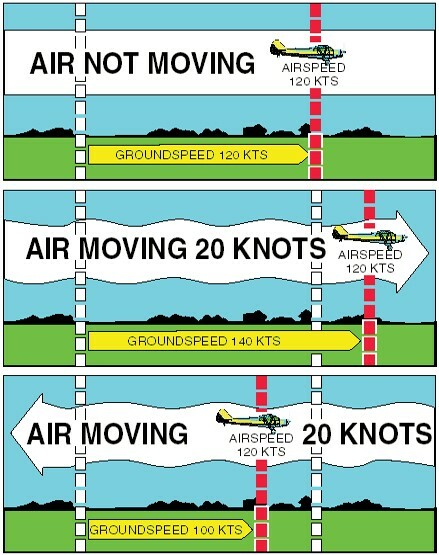 In flight at normal operating altitude the movement of the aircraft relative to the ground appears to be slow even when the airspeed is quite high.However, when the aircraft is flown closer to the ground, movement in relation to the ground becomes more apparent and illusions are created. If misinterpreted, they can develop into potentially dangerous flight conditions. 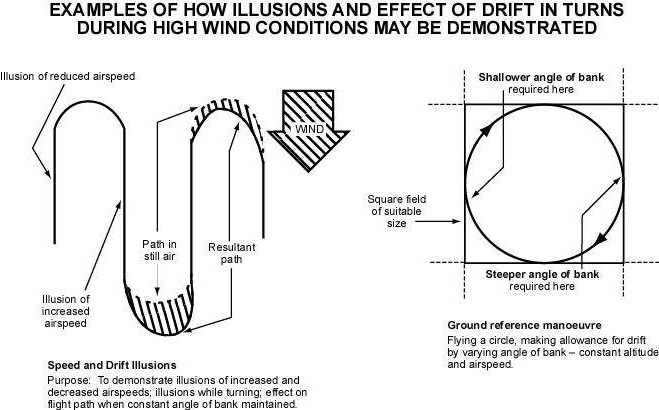 The drift of your airplane is the most important indication of wind direction and velocity. Smoke or dust gives a good indication of wind velocity. Tall grass and crops ripple give a good indication of the wind direction. Remember the wind condition at the point of departure, and the forecast for your destination. Reduced ground speed produces an illusion of reduced airspeed. Increase ground speed, produces an illusion of increased airspeed. This illusion can lead to reduce airspeed which if carried to extremes could lead to a stalled condition. Be careful in the circuit ! Because of the drift over the ground the aircraft seems to be slipping inward (inside the turn) even though the turn is accurate and well coordinated. This impression is an illusion and you must not use the rudder in the attempt to correct it. However the drift itself is very real and plenty down of room must be allowed when turning from upwind to downwind if there is an obstacle on the inside of the turn. Look to the horizon to have a big picture. Look the turn-coordinator to confirm that the ball is centered. The aircraft seems to skid outward (outside the turn) although the ball is centered. This is an illusion as well. Start your Turn earlier and increase your angle of bank. During a turn from into-wind to downwind during flight at low level in high wind conditions, a dangerous illusion may affect your flying. What illusion may be experienced? Name a condition where this could be dangerous? When turning from downwind to into-wind, the actual path of flight will not necessarily follow the still air flight path. Why? How to determine the wind direction?